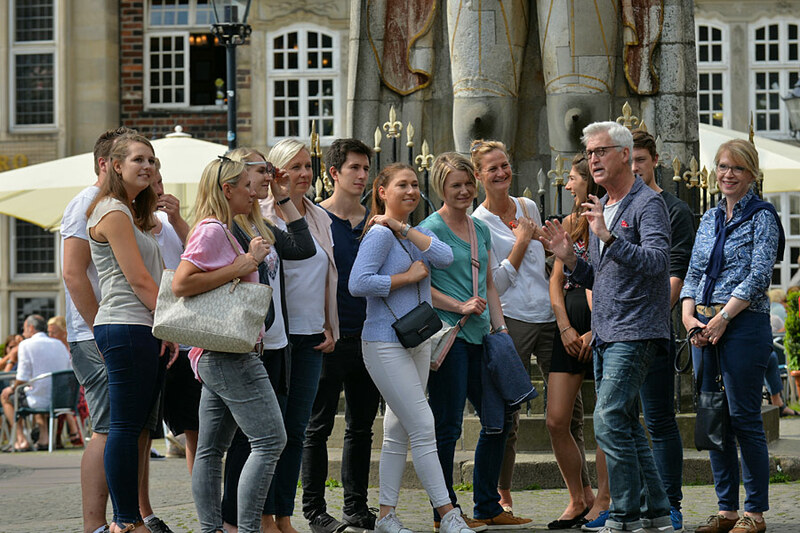 Join our guided city walk and explore Bremen´s special attractions. Find out about Bremen, its buildings, history and people. € 8.50 per person / free for children under 12 years accompanied by an adult, persons with wheelchair are free of charge, the attendant person must pay full price. Handicaped people with more than 50% disability get an reduction of 20%. From Jan.-April there will be a tour in German / English at 2 pm. on the right side in front of the Tourist-Information / Glockenspiel House in Böttcherstraße no. 4.
on 23.02.2019, 06.10.2019 and 26.10.2019 guided tours are not possible, because of big official events in the city centre. If you would like a guided tour of the city centre with your group at a time to suit you, further information on individual sightseeing tours can be found here.